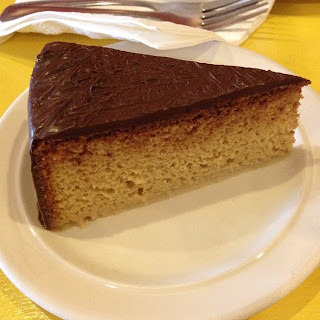 Kristoffer's Cafe & Bakery, without question, has the BEST TRES LECHES in Chicago! They are located on the very edge of Pilsen or very edge of University Village. Not only do they make great desserts, they also have delicious home cooked Mexican specials and possibly some of the best tamales I have ever eaten. The atmosphere is great for studying, but the amenities are not. Students encounter small tables, a dimly lit room, and slow internet. I know most of my blog rates food... but because I love studying in this place, their subpar study accommodations coupled with great study food, left me with an overall rating of 4.0 miles. Best tres leches in the city and easily the best I've ever eaten. When it's recommended by Rick Bayless... You know it's something special. The moist cake has been soaking in different creams and a nice layer of chocolate surrounded this vanilla flavored slice. They have many different flavors including caramel, kahlua, egg nog, and chocolate. Some flavors rotate depending on the season, but there is honestly no wrong choice. Another amazing dish from kristoffer's cafe!!! You can't make studying any better when you have a tamale stuffed with chicken, potatoes, peppers, olives, and a special salsa. It is extremely moist! 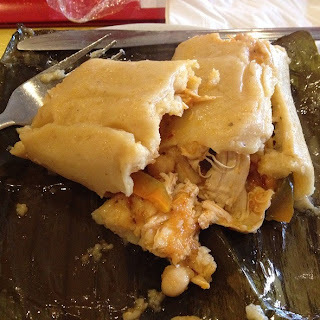 This is not an ordinary tamale... it is wrapped in banana leaves rather than the traditional corn husk. The flavors mix well together and there is no need for any salsa because of how the cheese, chicken, and other ingredients almost form a stew-like consistency surrounded by masa. Unfortuntately, these aren't the largest size, so a side of rice and beans may be needed to fill you up. 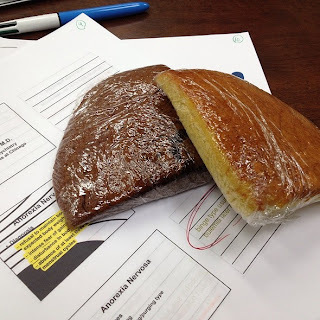 A typical Mexican breakfast lacking seasoning... It is simple, two eggs over easy topped with fresh salsas and served with rice and beans. They give you about 5 warmed tortillas. I like to roll the tortillas up and then bite the roll after each bite of egg/beans/rice mixture. I have seen different strategies like making tacos. Overall, it is sort of bland. Ask for additional salsa, it will help. 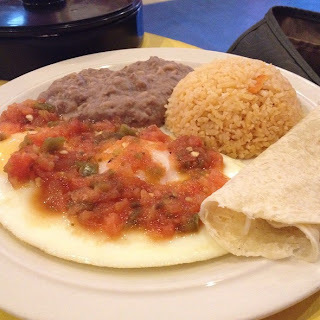 But if you are looking for classic, tasty huevos rancheros, I wouldn't order them here. 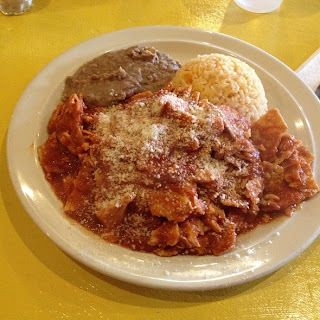 I absolutely love the chilaquiles from Kirstoffer's. It is an amazing mixture of chopped up tortillas and tortilla chips covered in a spicy (wished it was spicier) salsa and topped with sliced chicken breast and queso fresco. It comes out RIDICULOUSLY HOT which makes it even better. The portion size is great, and even comes with a side of rice and beans. The chicken is an additional cost and is a little disappointing because it isn't cooked in any mexican seasoning. Without the sauce, the chicken would be bland. It doesn't need it, so save the money and just have it vegetarian style. A great mexican style breakfast. 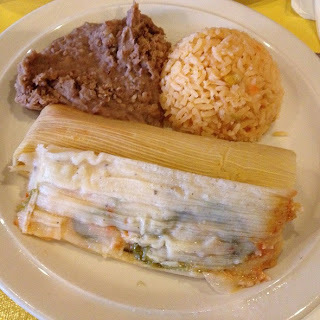 These tamales were the Mexican version filled with some kind of pepper and a spicy cheese. The tamale itself is not as dry as some of the other places in Chicago, but it is still much drier than the Mayan tamale. You do get two of them when you order the dinner which makes it enough for a meal. The rice again was a bit bland and the beans nothing special. I suggest the Mayan tamale over this one. 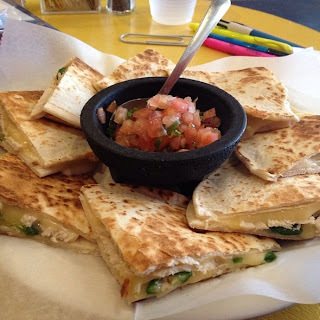 Nothing like a chicken quesadilla while studying... First of all, it is a huge order of quesadillas... the tortillas come out nice and crispy with all the cheese and chicken piping hot! I requested to make them spicy and kristoffer's willingly added sliced jalapeños to my chicken and cheese quesadillas. It is served with a fresh pico which makes it even better. They are a little on the pricey side, but for the large meal, it is worth it. I just wanted to say THANK YOU for being one of the only places to serve a non-greasy quesadilla. So when kristoffer's cafe makes Chicago's best tres leches, they have to cut the tops of the cake off before adding the milks. Well their cake is so good that the cake tops sell like crazy too! For a buck, you get a nice sweet, moist, and fluffy cake top... Either in chocolate or vanilla or in my case, both. Great to pair with a warm cup of coffee and much better than any of those pastries or danishes that other coffee shops offer. I usually grab a couple to go. - YOU HAVE TO ORDER THE TRES LECHES CAKE! you will not be disappointed! - Bring your study stuff. But be aware, the atmosphere may be great, but study space isn't that accommodating for students with lots of stuff. - Parking is free across at the local bank! So DO drive if needed! - Please DON'T forget to tip. There really is no waitress but the lady that makes the food will also come out and clean up after you. She is extremely nice and deserves a tip!